For as long as he can remember, Josh Feldman has eagerly embraced the latest technology. Decades ago, his family was the first one on the block with a VCR. Years later, when television went hi-def, he acquired a big-screen TV and signed up for HD service. So after he was diagnosed with lymphoma, it was only natural that Feldman was driven to join clinical trials for a promising new treatment. He would become one of the first UCLA Health patients to receive CAR T therapy. When nothing else worked, the treatment beat back cancer and filled his life with new hope. CAR T, which stands for “chimeric antigen receptor T cell,” is an immunotherapy­ — it fights disease by bolstering T cells, which play a central role in the immune response, to enhance the body’s own natural defenses. Two CAR T treatments were recently approved by the Food and Drug Administration, and on Feb. 1, UCLA Health became one of the few institutions to begin providing such therapy outside of clinical trials. For now, UCLA Health is offering one of the two treatments, for certain types of lymphoma — including diffuse large B-cell lymphoma — for which other therapies have proved ineffective; hospital officials expect to provide the other treatment, for a form of leukemia, in the coming months. With CAR T, the medical team gathers a patient’s T cells, which play a central role in the immune response. They then modify those cells to target diseased cells and reinfuse them into the patient. Feldman’s introduction to the uniquely roller-coaster world of cancer treatment began in a moment of joy. In 2010, while he and his wife, Julie, were honeymooning, he noticed a lump on the back of his neck about the size of a garbanzo bean. Upon their return home to Los Angeles, he sought medical advice. 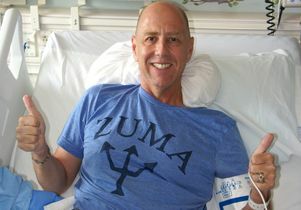 Courtesy of Josh Feldman - Feldman chose a special shirt for the day of his infusion. Some physicians wrote off the growth as a simple hematoma and declined to perform a biopsy. But one tenacious dermatologist insisted on looking deeper. When the diagnosis came back as follicular lymphoma, Julie immediately called UCLA Health. Chemotherapy drove the cancer into remission. However, the disease returned a year later, stronger this time. Feldman enrolled in a clinical trial for a different therapy led by Dr. John Timmerman, professor of medicine in UCLA’s Division of Hematology/Oncology. Feldman dropped out of the study because of the treatment’s disruptive side effects, but he was left with a strong impression of Timmerman. In the following years, cancer and complications from his treatment ate away at Feldman’s health and quality of life. Work suffered, as it became harder to maintain the photography business he and Julie ran. Play took a hit as well, with the disease keeping him off his surfboard and away from the big waves he loved off of Malibu, California. The Feldmans were fortunate to gain some solace from frequent getaways to Hawaii. Meanwhile, though, the lymphoma prevailed over everything doctors threw at it, whether pills or heavy chemotherapy in anticipation of a stem cell transplant. Then, the tide turned. Starting in 2015, Timmerman helped run a multisite clinical trial of CAR T therapy for lymphoma, and Feldman joined up. The trial, which was sponsored by Kite Pharma, was called Zuma-1, after the Malibu beach — which the Feldmans took as a good omen because of Josh’s love for surfing. But there were some obstacles between the day his immune cells were drawn and when he received the re-educated cells, including the discovery of a tumor in his pancreas that was blocking a bile duct. After receiving a stent for the blocked duct, Feldman faced a second delay as doctors checked for infection out of an abundance of caution. The third try turned out to be the charm. On the day of his infusion, on a UCLA hospital floor usually reserved for stem cell transplants, Feldman sat down for the procedure, surrounded by his wife and a team of caring nurses. The Feldmans wore t-shirts emblazoned with the name “Zuma” and a graphic of the spear of Triton, the messenger of the seas in Greek mythology. “I could visualize that trident spearing the malignant cancer cells and really wreaking havoc on them,” Feldman said. The therapy did its job with side effects no worse than a mild fever. After repeated scans over the next 18 months, Timmerman was able to deliver the good news: Doctors saw no signs of the cancer. For Feldman, it was a new kind of relief. 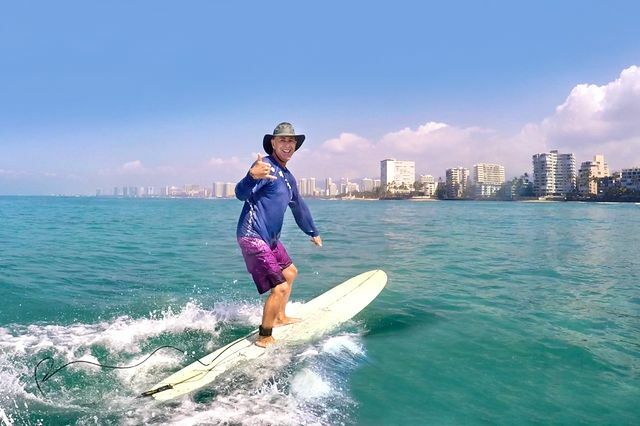 Courtesy of Josh Feldman - Feldman figured the clinical trial’s name was a good omen because of his love of surfing. The treatment’s success has been gratifying for Timmerman as well. But he cautioned that CAR T therapy is not for everyone. “While current CAR T cell therapies can be used to treat many patients with lymphoma and leukemia, the treatment can be arduous and patients must have strong underlying organ function,” Timmerman said. “Additional research and experience with this technology will make the treatments safer so they can be applied to most eligible patients. As of 18 months after he got his souped-up T cells, Josh Feldman remained free of lymphoma. He and Julie recently moved from Los Angeles to Hawaii and the good life that before had been an escape. Feldman offered encouragement to people with cancer who are running out of conventional treatment options, as he once was: Seek out clinical trials like the one that has worked for him. Learn more about the cancer research theme at UCLA.